I took this picture of my youngest last week. She is a grimy, messy, dirty child. LOL! A day doesn't go by when she doesn't need at least 2 baths and 2 changes of clothing. 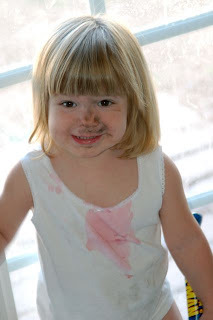 I'm not sure what she spilled down her pajama top, but her face (and hands and legs and feet) were covered in dirt from digging outdoors. She's always happy, and doesn't care at all about the mess. I call her my "Tide Baby" from those old Tide laundry detergent commercials. I use more Borax and OxyClean and Spray and Wash on her clothes than I have EVER used on both the boys. So, once again -- here's my Tide Baby! Tell Me Thursday is for all the folks who play Wordless Wednesday -- but want to share the story behind their picture/s! Head on over and read about the contest they're running for a new Flip HD video camera!! Messy is FUN! Great photo and story. Thanks again for participating! I have one of those. Are you sure I didn't misplace my daughter at your house? My six year old is always filthy! My Tell Me Thursday is here.